Northampton have become the second club to take issue with the Rugby Football Union over its approach to building a new England coaching team. 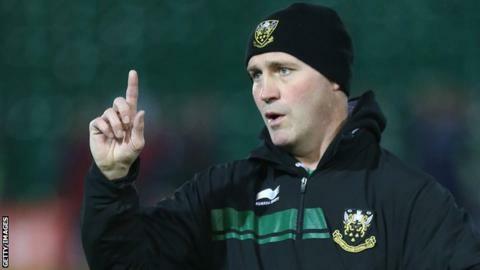 The new England boss Eddie Jones has identified Saints backs coach Alex King as his final appointment, joining Steve Borthwick and Paul Gustard. However, Bristol say they have not given Borthwick permission to leave. And Saints boss Jim Mallinder says Saints have been "kept in the dark" about any approach for King. Northampton say they have "had no formal approach" from the RFU - something described as "disappointing" by Mallinder - and could make an official complaint. Jones has met with former England, Wasps and Clermont fly-half King but Mallinder is unaware of the contents of their conversation. And the Northampton boss insisted the uncertainty over King was a distraction heading into the 9-9 Champions Cup draw with Racing 92 at Franklin's Gardens on Friday. "Alex King is a key part of our coaching staff. We're in a vital part of the season," said Mallinder. "What you don't want to hear by reading in the press or being told is that somebody is talking to one of your coaches." When asked if Northampton would be making a complaint, Mallinder replied: "We don't want to talk about compensation because we don't know if Alex will be their new backs coach or not. "It's very early to discuss that. Alex has told me that he's met Eddie and that's all that I know. It's certainly not ideal."